David D. Levine, Arabella of Mars — I’m about 75% done with this one, and I’m liking it a lot! Three words: Regency space opera! Julianne Donaldson, Edenbrooke — I’ve already read and enjoyed Donaldson’s other novel Blackmoore, so I’m sure I’ll like this one too! Chris Cleave, Everyone Brave Is Forgiven — A World War II novel that caught my eye, although I honestly don’t know much about it. This is the biggest gamble of the bunch, but I’m optimistic. Erika Johansen, The Invasion of the Tearling — I quite liked The Queen of the Tearling and have been meaning to read this sequel for a while. I’ll be chronicling my progress in another post, so stay tuned! 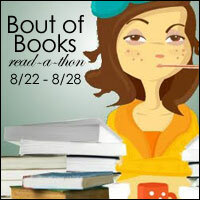 Are you participating in Bout of Books this time? If so, what are you planning to read?